For centuries (before the development of commercial yeasts), sourdough was the only way you could make leavened bread. As the name suggests, sourdough has a slightly sour taste, but it also has a gorgeous bubbly texture to the crumb, and serious bite to the crust. But before you can make delicious sourdough bread, you need a starter culture - this is how to make it. Sourdough relies on wild yeast spores that are found in flour and in the air. Mix equal parts of flour and water in a plastic container. Stir well until you have a thick paste. Cover loosely and leave in a warm place. For the first week of your starter's life (and yes, it is alive), you need to feed it with flour and water at about the same time each day. How much you feed it depends on how frequently and how much you intend to bake. I plan to make 1 loaf a week initially, to a recipe that requires 200g of starter, so I don't need my starter to be more than 500g. As your starter grows, it should become bubbly and frothy. It should also have a pungent yeasty smell. 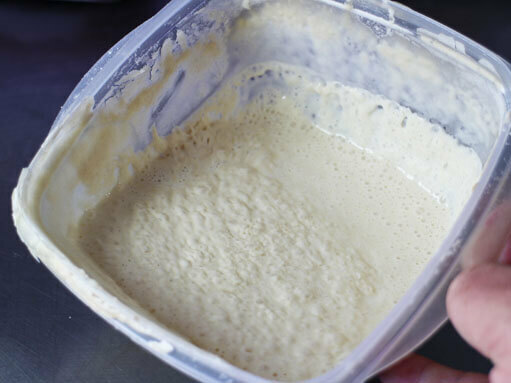 Your starter should be usable after about 5 days, although it can take longer depending on a number of factors. Scoop out the amount you need and make bread according to whatever recipe you are using. Theoretically, a well-maintained starter should last forever. Once you've used some of the starter, add more flour and water. At this point, you can keep it in the fridge and bring it out the day before your next bake. Give it a good feed to get it fizzing again, then use half of it in your recipe. The video above is from the Keef Cooks YouTube channel. Click here to see the video recipe of How to make a Sourdough Starter on YouTube. Prep time: 5 minutes. Bubbling time: 5 days. Total time: A long time.